Floyd's post on Hokkaido Milk Bread, which mentioned red bean filling, started nagging me to make red bean rolls. Fortunately, I had a stash of home made red bean paste in my freezer, which was given to me by a good friend. So why delay? I decided to use Hamelman's Soft Butter Rolls formula as a base for my rolls. Instead of instant yeast I decided to go with RYW levain. I usually don't use sourdough starter in my soft breads, but I thought this time it would give a nice contrast to the red bean paste. But either my sourdough is too sour or I am too much of a sourdough wimp, so I always build my sourdough with RYW in my hearth breads and I did the same here and used a small amount. And as the post on tang zhong seemed to be the driving force behind these rolls, it was a given. Kneaded in Bread Machine till I got a window pane (almost full 20 minutes of dough cycle). Put the dough in an oiled bowl. Did 3 S&F at 30 minutes interval. The dough was quite well developed & strong after the last S&F. Retarded in fridge overnight. Next day, divided it in 20 pieces and pre shaped in rough rounds and rested for 15 minutes. Decided to make 10 red bean rolls & 10 ham-n-cheese for kids. Used monterey jack cheese with black pepper ham. 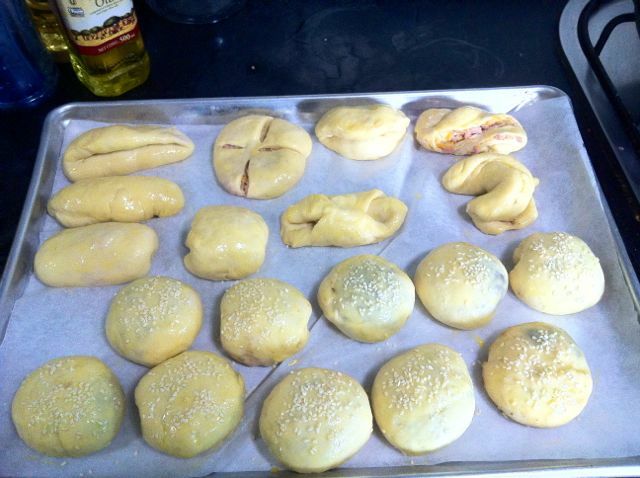 My shaping skills are hilarious, as the photos testify, so shaping rolls is always the most tedious part for me. I was just glad to be done with it. Kept for final proof for one hour. Fifteen minutes before baking, put egg wash & sprinkled sesame seeds over red bean rolls. Baked at 180 C for 20 minutes, rotating the tray after 10 minutes. Notwithstanding their ugly look, the rolls were all that I wanted. 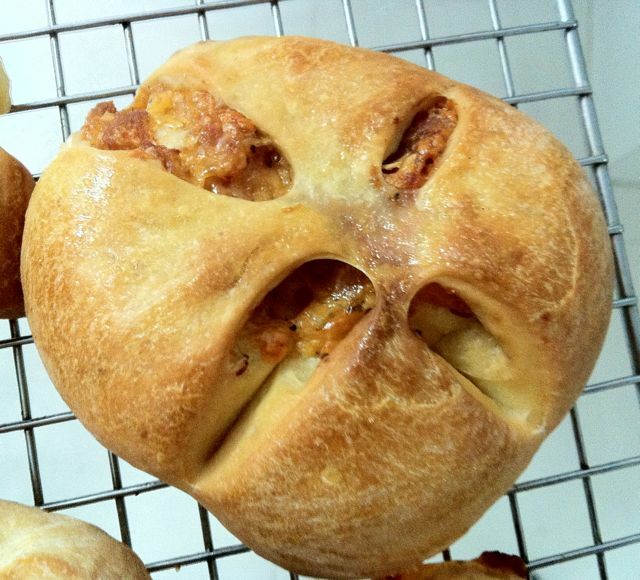 The slight tang added by sourdough gave an extra flavour note to the rolls. The tang zhong & ryw helped the softness. If they had lasted beyond one day, I hope the SD & TZ would have kept them from getting stale. But as it goes, my daughter and her school friends managed to devour them in no time and have ordered another batch ASAP. I have agreed on the condition that they help me to shape the rolls next time. They are quite willing and I am confident the 12 year olds have better dexterity than me :). around for a hamburger bun and this one might be it. Those stuffed rolls had to be great in every way. A little smaller and you would have made Dim Sum :-) I have never used YW for the liquid in a SD levain like you did. I guess that would really tame the tang! I guess I have built the two levains together though and that would be the same thing. Your shaping looks like mine....I say you can't really taste the shape very much at all and it won't get any worse with practice! Combination of SD & RYW works wonders for me. You will have to shape with your non dominant hand to match mine, but I also hope my shaping improves with practice :). I also have a feeling that would do much better if I had apprentices like your's or Ian's! Glad you liked the rolls, Dabrownman. YW has not caused any problem for me. If I use SD in my breads, I go overboard with YW to offset the tang. Many times, I use RYW to build the levain & then replace the balance liquid in the dough with old stock of RYW. I am not sure about how active the old RYW is, but it has not affected the bread negatively. The filling sounds tasty and sounds likes they must have tasted great since they went so quickly! Thanks for your kind comments, Ian. I live in hope that one day my shaping & scoring will match the taste of bread!